Continuing from yesterday’s story about poor Wang who has been accused and sent to jail. On the upper print, Chun (second right) found out the news and rushed to the court, she made an appeal and Wang was released. 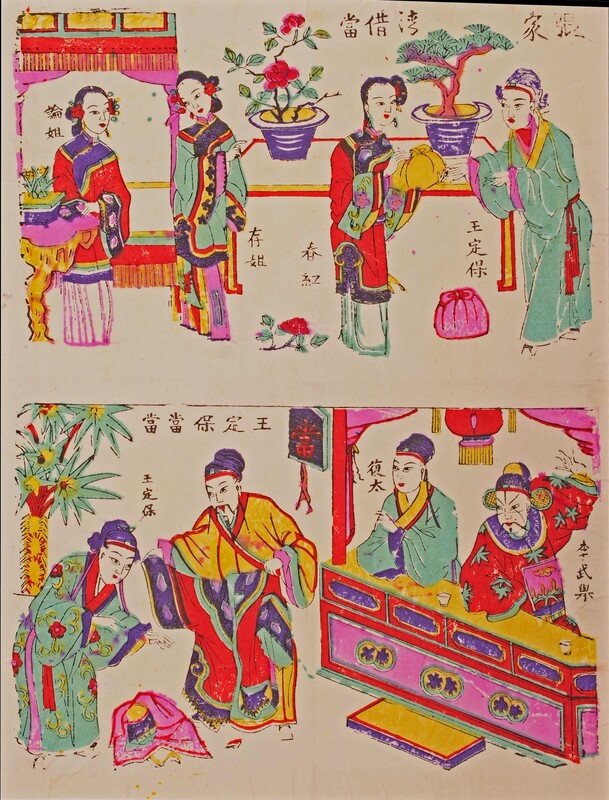 The lower print features the wedding night of Wang and Chun, the happy couple lived happily ever after. 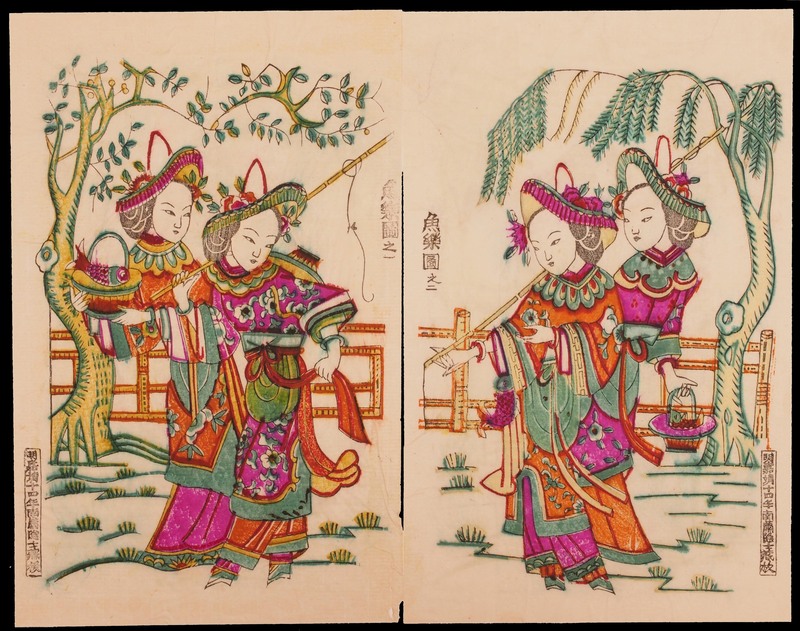 A pair of two wood block prints which will be featured in today and tomorrow’s post, tells a story based on the Shandong opera. Student Wang made a gamble with the other students while the teacher was away. With his bad luck, Wang loses at every game and was heavily in debt. He knew he would get into trouble is he asked his family for help and was trouble all the time. 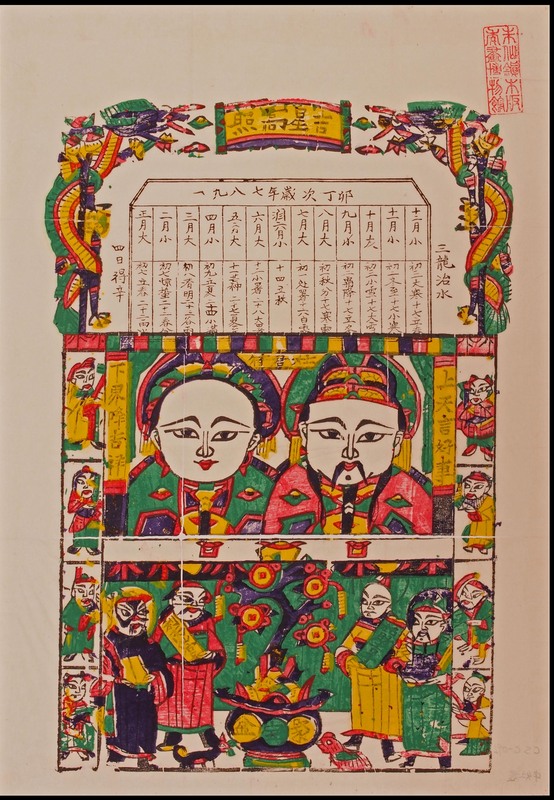 Wang’s fiancee, Chun (second right figure on upper print) learnt about the news and gave her bridal gown to Wang so it can be sold off. 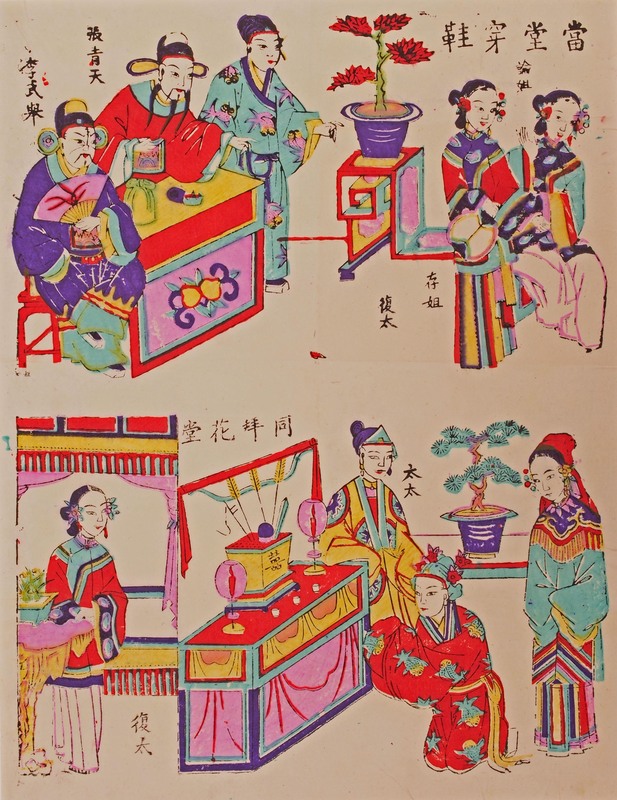 The second scene appears in the lower print; the village bully Li (far right figure) was attracted by the beauty of Chun and decided to accuse Wang (far left) for stealing the precious gown. Li’s plan is to send Wang off to jail and he can have Chun. To find out the ending of the story, watch out for tomorrow’s post. 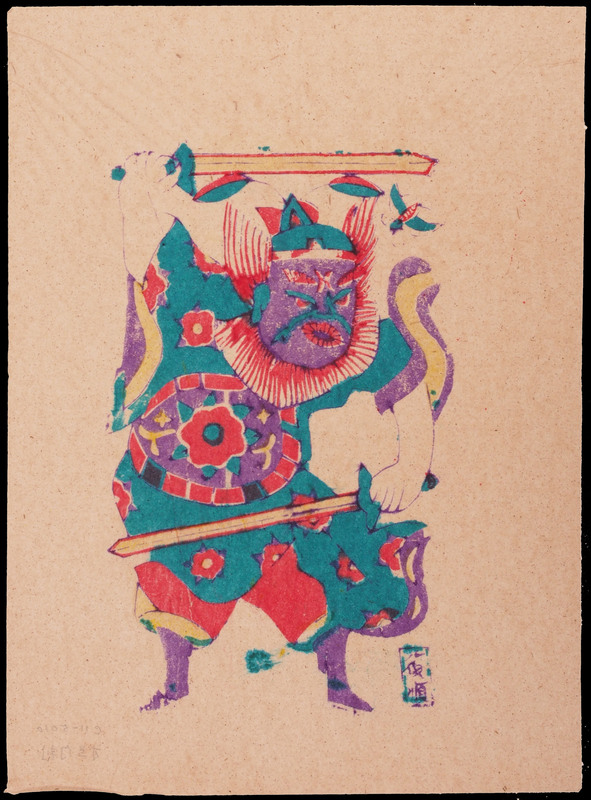 Basing on the Qing dynasty detective fiction, Si Gong On, this wood block print features the 4 police guards who assist Detective Si in solving the mysterious cases. 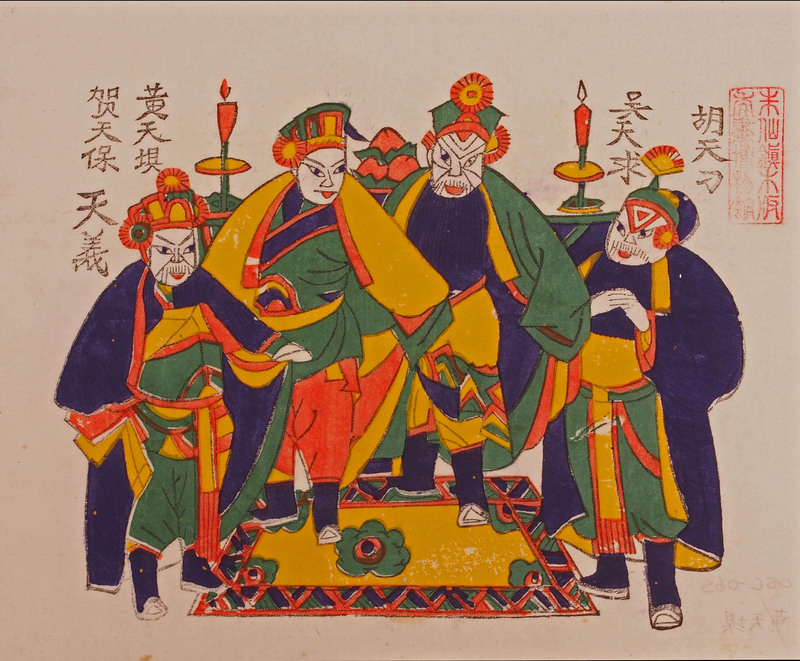 The gang of 4 is headed by Huang Tian Ba (second left), Huang attempted to assassinate Si but was captured. Detective Si had him release, Huang was converted and stayed behind to help Si. The other guards, from left to right, are He Tian Bao, Huang Tian Ba, Wu Tian Qiu and Hu Tian Diao. 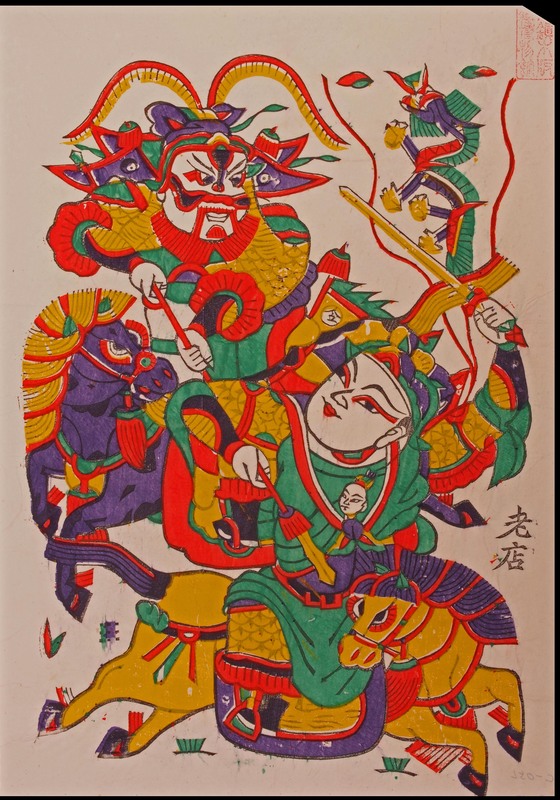 This wood block print entitled, “The 8 Immortal’s birthday celebration“. life being as grand as the Mount Nanshan, fortune as deep as the Donghai ocean. 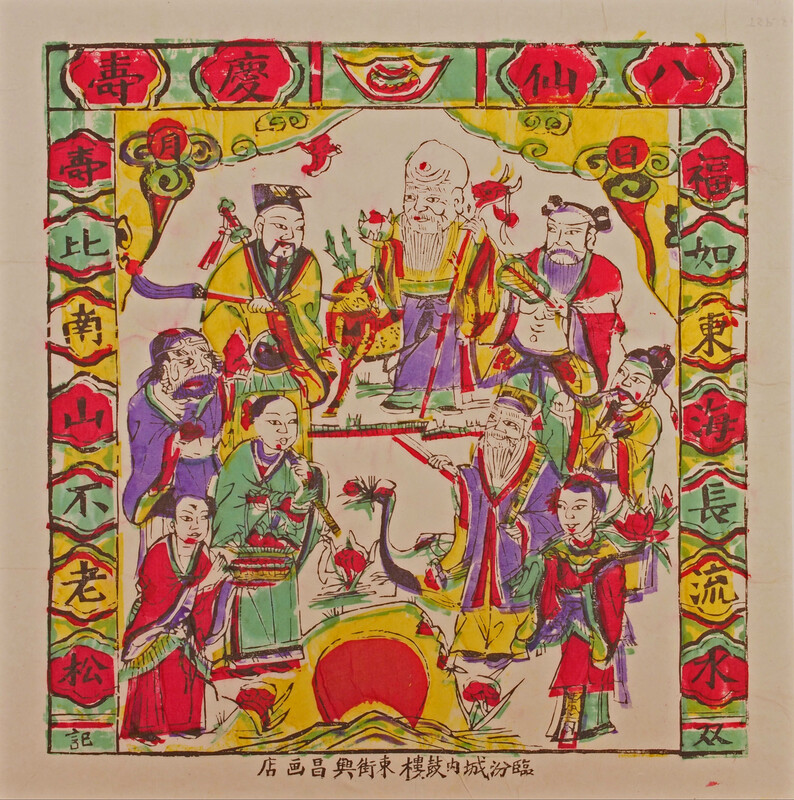 In the prints are the 8 Immortals; (from 12 o’clock going clockwise are) the God of Longevity, Zhong Li Quan (with the palm leave fan), Royal Uncle Cao Guo Jiu (with castanets), Elder Zhang Guo Lao, Immortal lady He Zian Gu (with magic lotus), Philosopher Han Xiang Zi, Lan Cai He (with magic basket), Iron-Crutch Tie Guai Li, Leader Lu Dong Bin (with sword). Click here to see the symbolism of the magic tools. This rooster wood block print ,being horizontal and elongated in shape, is a special type of print that is used for the decoration of the top of the window frame. Click here to find out more about wood block print for window frame. It is an ancient tradition to decorate windows with roosters painting, in the Han dynasty fortune forecast book it was recorded that on the first day of Chinese new year the fortune of the rooster should be cast, second day for the dog, third day for the pig, fourth day the goat, fifth day the cow, sixth day the horse. it is not until the seventh day that we should tell the fortune of the human. The rooster being the first animal might have came from it presumed ability to call up the sun with its crow, a sign of life from the darkness. 五子登科 Wu Zi Deng Ke, is an idiom of blessing to wish great achievement for the off springs. 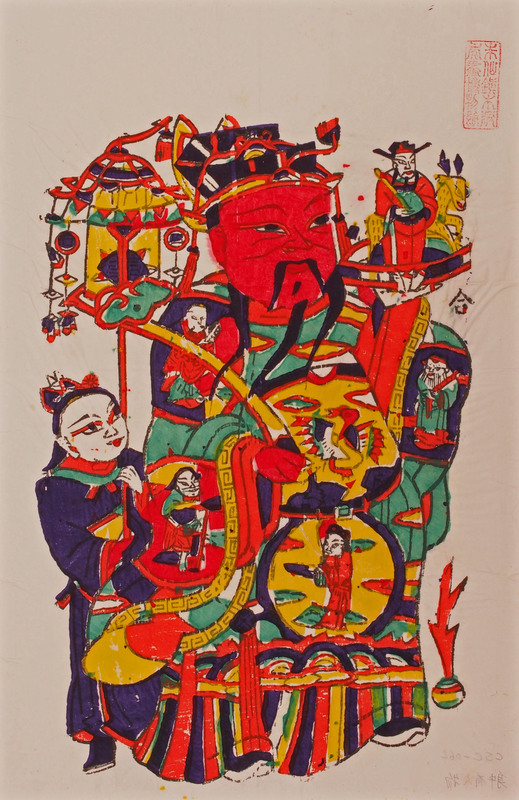 There is a man named Dou Yu Jun, a scholar of the court in the 5 Dynasty period, he had 5 sons at late age. All 5 sons had great academic achievements and came top in the official examination. Since the Siu dynasty 605 AD, China has developed a system in the selection of her officials basing on a literature examination, it is every parents’ wish for their son to do well in the exam. For 5 sons to do came top on the list would be one’s widest dream and blessing. A wood block print depicting the ladies of the wealthy family’s fishing outing. Zhong Kui, the Chinese ghost buster. Here is the story of Zhong Kui; the Tang dynasty emperor fell gravely ill on an out of court trip, the court doctors tried varies ways of treating him but in vain. One night the emperor dreamed of a small man in red stealing his jewels, when he looked closely he realized it is not a man but a ghost. The emperor was taken aback and right then a large figure wearing a torn hat appeared, the large man grabbed the tiny ghost and put it in his mouth and swallowed him in whole. The emperor was relieved and ask who he was, the large man replied that he was a top scholar but he was found too ugly to be taken up as a court official. He was so upset that he killed himself at the court and since then he had concentrated on catching evil spirits. When the emperor woke up, all the illness has disappeared, he had someone painted Zhong Kui’s figure from the memory of his dream and an officially assigned the task as a ghost buster and the judge of the underworld. A scene from the Ming dynasty novel “Romance of the 3 Kingdoms” – Zhao Zilou’s Battle of Chang San. Half way into the novel; Cao Cao attacked the city of Fan where Liu Bei stationed, Lau decided to evacuate the city with its residents but was surrounded by Cao’s army in Chang San. The brave general Zhao Zilou managed to break through the enemy’s line of attack and rescued Lau and his family. The warrior on the left Cao Cao, on the right is Zhao Zilou. You might be wondering who the little head inside Zhao’s jacket; that is Lau Bei’s son Adou.